Felo'melorn is the Fire Mage Artifact. It has been wielded by Dath'Remar Sunstrider, and many other Sunstriders down the Sunstrider line, up to and including Kael'thas Sunstrider, the last of the Sunstriders, who had it reforged "with magic, and hatred, and a burning need for revenge". Until all the 3D models are put up, you can see (all?) 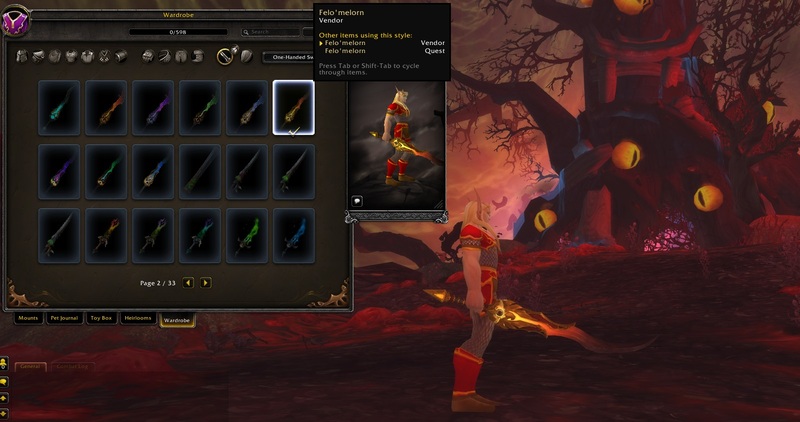 the possible looks for this weapon (and the related off-hand) here, on wowhead. Here on WoWhead, you can also find an alpha rough list of current Artifact Traits for Felo'Melorn. No Crit? Or am I missing something here? Felomelorn seems to automatically generate Flame Orb. This transforms your next Pyroblast into a stronger Phoenix's Flames which does more dmg and splashes. Later on we can unlock Phoenix Reborn which will generate extra Flame Orb. The buff from equiping felomelorn seems to be Highblade's Will. This is going to be weird as a Night Elf mage :o. However, I love everything about this blade. Pyromaniacs ftw! As someone who plays a blood elf fire mage I approve. It appears that the Heart of the Phoenix is the offhand for the fire-mage artifact Felo'melorn. The most annoying thing about these artifacts right now is trying to find out what artifact offhand goes with what- which (unless you know where to look*) makes it particularly hard to use the Legion Dressing Room and match artifact weapons. *Currently, at the top of the WoWhead page, you will find the "Legion" droptab with the tab "Artifact" under the category of "New Items", that link should take you to the list of all artifact weapons (and offhands) available. The fact this blade is coming is making me tear up it's so beautiful. I've been in love with this sword from the first time I saw it, and now My mage will actually have it. This right here is the reason I pre-purchased Legion. Even though Warlocks got Verdant Spheres in MoP, Kael'thas' blade confirms Blood Magi to be represented by Magi in WoW. Players with Felo'melorn equipped have a unique interaction with Arcanomancer Vridiel. Arcanomancer Vridiel is an NPC found in the Blacksmithing shop (Tanks for Everything) in Dalaran (Legion version) at (45,29). He is a Blacksmithing trainer that teaches various levels of Blacksmithing. A silver star on your minimap will indicate that he has something for you. Check below for details. Is it true? Do you wield Felo'melorn? Come, speak with me. So the stories are true - you've recovered Felo'melorn! Shattered during the third war, Prince Kael'thas ordered its repair. Elven blades grow stronger with each reforging, but only in the hands of the finest craftsmen. I have never seen such a wonder. May I hold it? This is not some brutish cleaver for the hacking of flesh. It is the slender blade of a tactician. Strands of arcane energy have been woven into the steel with each fold. I can feel its heat radiating down my arms. Magnificent! Thank you. I have labored a hundred lifetimes and have not seen its like. Examiner Andoren Dawnrise at in Azsuna is another NPC that will react to wielders of Felo'melorn in a unique way! This still doesn't have crit on it a month before release, why did it never get changed? While wielding this weapon, occasionally your killing blows will leave the target's corpse blackened and smoldering. Can someone post a guide on how to defeat Lyandra Sunstrider? Haste and Mastery.... for a fire mage. Really Blizz? The Scimitar of the Sirocco can be quiet the grind (Archeology Tol'vir, took me about 450 solves to solve all Tol'vir rares, was lucky to get the Scimitar at around 200), but at least you will probably be unique on your realm. The weapon itself is not that special, but the weapon effect is something else, as it slowly follows your movements. The offhand drops on Karazhan's Nightbane, with a droprate of 16.6%. On average, it will take 6 weeks to farm this nifty fire spewing offhand. If you're missing your off-hand after a character transfer or faction change, un-equip your weapon and re-equip it to get it back.